Warning: Disciplinary spanking of a minor by a mentor. I do not advocate the spanking of minors in real life, only in fiction. I also do not advocate giving minors specialized suits that encourage them to put their lives in danger by fighting crime every night in real life, only in fiction. Also, I don’t see Tony as a good mentor, and my story reflects that. He’s trying to be a good mentor, but he’s failing because he has no idea what it means to be a good mentor. “I’m gonna need that back.” Tony said pointing at Peter’s chest. “For how long?” Peter said, obviously upset. “Forever.” Tony said with finality, not quite understanding why the teen thought he’d ever get it back after running amok with it. It was exceptionally difficult for Tony to stick to his decision with the kid looking at him with that sorrowful expression. He couldn’t help but think about his own childhood every time he interacted with Peter, which was a big part of why he avoided the boy as much as possible. Tony remembered the sick feeling in the pit of his stomach when he realized he’d done something to anger his father, and the way that feeling would fester and turn to hate as Howard shunned him for days. He shook his head, and tried to come up with a solution that didn’t leave the teen feeling the way he used to. He thought about Cap, who was the most decent, upstanding, and well-adjusted person he knew, and tried to envision what he’d do with the kid. The answer came easily. Cap would give the teen a second chance, and go with the grounding, because Captain America always saw the good in people. But then if Cap was mentoring Peter, grounding would be enough because Cap was a decent, honorable, and upstanding man, and the boy would be trying to emulate him. Tony didn’t think of himself as particularly decent, honorable, or upstanding, so what was there for the kid to emulate? Tony thought about Thor, who was also an honorable and decent man, and wondered what he would do. Then he remembered a story Thor had told him about his childhood with Loki, and their father’s method of correcting bad behavior. As soon as the idea hit him, Tony nodded. He doubted Cap would approve, but Cap didn’t approve of half the things Tony did. And Tony knew he would have jumped at the chance to redeem himself if his father had given him the option of a spanking over being ignored for days. Peter slowly put his hand up, and pushed the button to loosen the suit. He carefully and self-consciously stepped out of it before reluctantly handing it over with the expression of a sad puppy. He shivered in his boxers as he watched Tony put the Spiderman suit on the ground. Confused, Peter moved to the indicated spot. Tony raised an eyebrow and said, “You want the suit back in a month? Going through with this is the only way that’s happening. Your choice, but knock off the chatter and make up your mind, because I’ve got more important things to do with my time than this.” Not to mention he was going to lose his nerve if the kid didn’t hurry up. Peter bit his lip, looked back at the suit, and then at Iron Man’s lap. There was no way he could give up the suit forever, and he did feel exceptionally guilty for what had just happened. Coming to a decision, he hung his head, and felt his eyes filling with tears as he stepped towards Tony. Tony took the boy’s arm and tried to pull him over his lap, but Peter used his strength to keep himself upright. A small whimper was Peter’s only response. Looking back down at the ground, Peter muttered, “Spanking.” This time he didn’t resist as Tony pulled him across his lap. After wrapping one arm around the kid’s waist to keep him in place, Tony used a fraction of the suit’s strength to smack Peter’s blue boxer shorts. The teen didn’t jump, hiss, or have any visible reaction. Tony had been using his suit long enough to know that the force of that blow on a normal human would have caused bruising. He lifted his hand and doubled the strength of the blow. 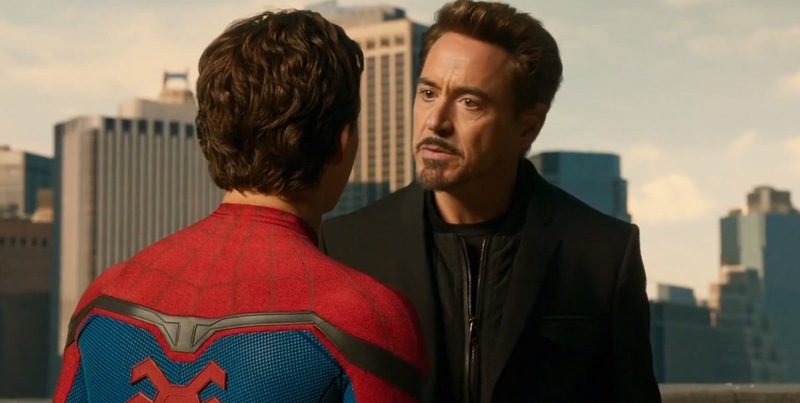 When that still got no reaction out of Peter, Tony wondered exactly how strong the boy was, and since he was still growing, how strong he’d eventually become. He lifted his hand again, and went for a full force blow. A soft grunt came out of Peter, and his body tensed. Figuring that was the right strength, Tony started talking, and then laid down a spank for each word he emphasized, as if each harsh slap were a punctuation mark for his thoughts. When he paused to take a large breath, he noticed Peter’s shoulders were shaking, and realized with shock that the teen was quietly crying. He froze, and only then did it occur to him that he probably should have been keeping count. He had no idea how many smacks he’d given, and he hadn’t really been paying attention to where the blows landed other than on top of the boxers. For all he knew every one of the smacks could have been in exactly the same spot. Jesus, what if he’d really hurt the boy? Peter got out a teary, “What?” and then a mortified, “Oh, God,” as his boxers were pulled down slightly. Peter instantly shoved himself up, and stepped back a few feet, keeping his head down, and wiping at his face. The teen nodded and clearly tried to stop crying without much success if the stuttered breath was any indication. Peter grabbed a fist full of the older man’s jacket, and leaned into the hug. “I’m sorry,” he said softly. “Yeah, I know, but I don’t need you to be sorry. I need you to be better…” he didn’t tack on the ‘than me’ that he’d been thinking. Not able to stand the hug any longer, Tony pulled away, and said, “Okay it’s past time to get you home. Stay here, and I’ll go get you some clothes.” He stepped into his Iron Man suit, picked up the Spiderman suit from the ground, and then flew off to find something for the kid to wear home. Feeling slightly better about it, Tony headed for home and tried to decide how to explain this to Happy in a way that wouldn’t get him ratted out to Pepper.